How far does unconditional love go when a parent is dealing with a drug-addicted child? The subject was explored rather listlessly just weeks ago in the film Beautiful Boy, but Peter Hedges' thrilling and poignant Ben is Back does a much better job. The similarities between the two films end with the subject of drug addiction, as this film deals with what happens long after it has taken root and settled into the bones of the family. Can trust ever be regained when there has been so many years of repeated hurt and anguish? 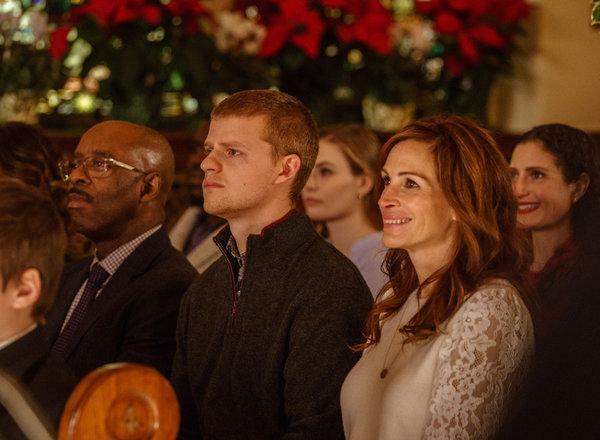 Ben is Back stars the impeccable Julia Roberts and the director's son, Lucas Hedges, who is having yet another phenomenal year playing at-risk youths. The film is set over the Christmas holiday, a time of joyous family reunions, and it's now that Holly (Roberts) is getting the reunion she's been hoping for. Standing in front of the house as she pulls up is her son, Ben (Hedges), and Holly is overjoyed to see him. Her daughter, Ivy (Kathryn Newton), looks more concerned than anything. In a flash she's on the phone calling someone, while Holly is dashing to give Ben a big hug. But this isn't a movie about relapse. It's not even a movie about curing Ben of his addictions. It's a film about trust, and how somebody like Ben can possibly ever earn it back. But trust is a double-edged sword. You can trust a person will tell you the truth, but sometimes that truth isn't what you want to accept. Ben swears he is sober and has been for weeks, but Holly and Neal demand a drug test if he's going to stay the night. And it's only for the night; after that he goes back to the rehab facility. Everything is tense, his motivations for being there are cloudy, and let's just say this will be one edgy yuletide celebration. The question constantly at play throughout Ben is Back is, "How far can we trust Ben to be truthful?" He puts on a good story; he's clean, he insists on buying his own Christmas presents, he agrees to never be out of Holly's sight. Ben is saying and doing all of the right things. At the same time, is Holly as blinded by love for her prodigal son as she appears to be? Answers don't come quickly, and more questions emerge after a Christmas Eve break-in leads Ben and Holly through a dark, violent journey he's all too comfortable with but is new to her. "I used there. I robbed someone there", he tells her as they revisit some of his old haunts. He's strangely calm and accepting of the terrible things he's done in the past. Holly looks like she doesn't know her own son, which is probably true. It's a surprisingly exciting turn for the dramatic film into thriller territory, but also a welcome one. My biggest fear was this would be another morose story of heartbreaking disappointments. Ben is Back explores the devastating impact of drug addiction on a family while also being an entertaining, insightful film with pulse-quickening surprises. Roberts gives a devastating performance as a mother torn between her protective instinct and the memory of who her son used to be. As Holly, she desperately grasps for anything resembling hope. When another mom of an addict tells her, "We can't save them, but we have to try", it's like a shot of adrenaline. Roberts is thankfully free from the hysterics a role like this invites, and Hedges is equally measured in his portrayal as Ben, who is remorseful over what he's done but accepting of the person he is now. Whether others accept it is a different story, one that Ben is Back tells with disarming honesty.